The official start to Summer is just days away, and we could not be more excited! We are so ready for eight weeks packed full of lounging at the pool, frolicking on the beach, sleeping in late, playing in the yard until it's dark (or way past dark), skiing behind the boat, and grilling out with friends. Occasionally we might have to throw some work in here or there, a sibling battle will probably occur, and we will hear "I'm bored!" approximately 5,498 times, but the sweet summertime memories we will make will far outweigh those few moments. Summer is by far my favorite time of year to entertain. There's just something about this time of year that makes entertaining so much fun. In the south summer wouldn't be complete without at least a dozen cookouts thrown in. From impromptu steak on the grill nights with neighbors to over the top backyard soirees with friends and family to celebrate a holiday - I love it all! I sit back in my favorite adirondack chair with my favorite Milo's Sweet Tea to cool me off, and smile knowing these are the best days. Because I love hosting people in my home this time of year I make sure to have a few staples always on hand, and have a few quick go-to recipes in my back pocket that I can whip up with in minutes. I love hosting. I do not love spending my entire time in my kitchen cooking the perfect meal. I love being able to wow people with my mad kitchen skills, and making it all look effortless because, well, I've made it effortless. 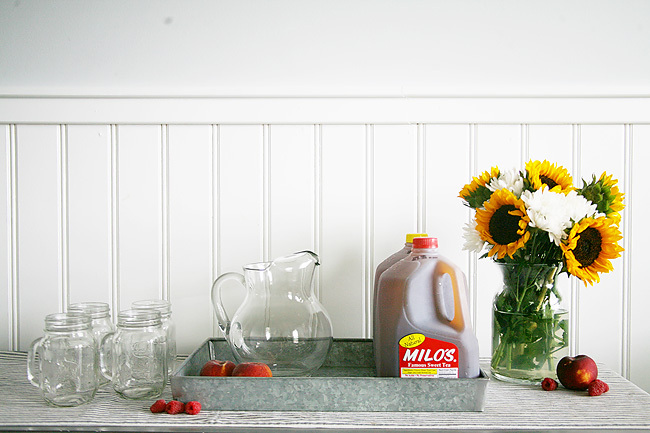 Southern host tip #1: Always always have sweet tea on hand. Always. 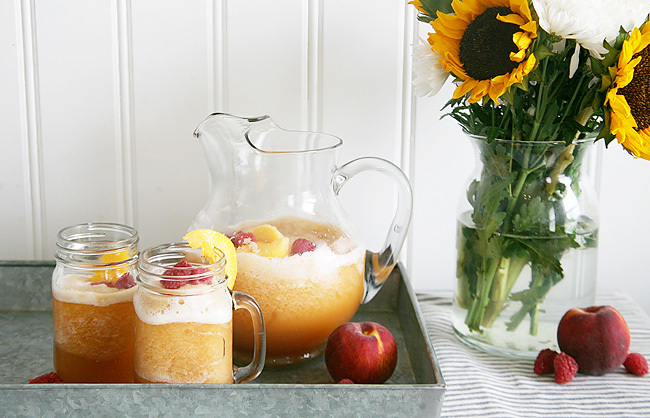 As any good southern host knows, no event is worth mentioning unless sweet tea is involved - especially in the summer! And it better be made to perfection or people will be speaking about it for decades. 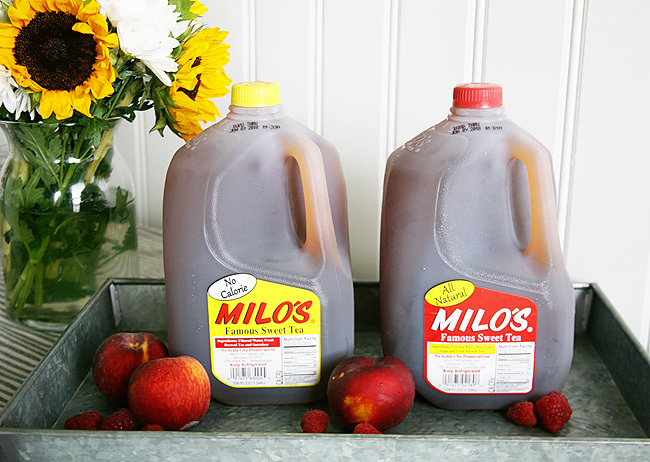 I always make sure I have a large stash of Milo's Tea on hand. 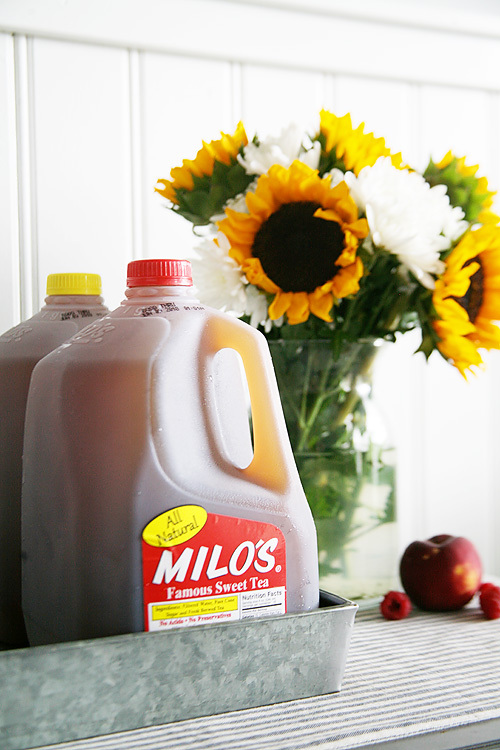 Milo's Tea is the absolute best tasting and remember my whole commitment to effortless entertaining? They are the experts in tea making and who am I to come in and try replicate perfection? 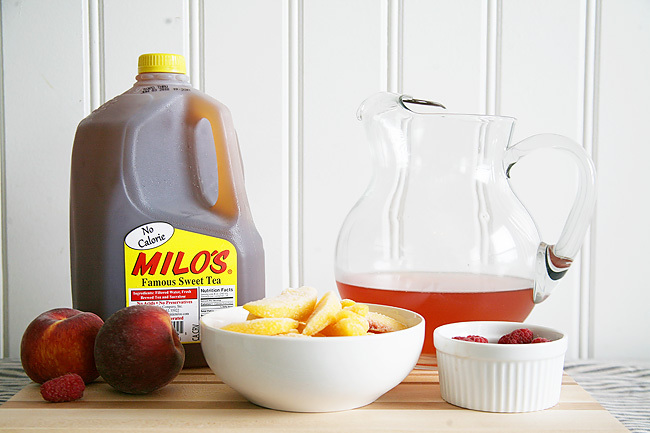 Milo'sTea comes in a variety of different flavors (all natural sweetened with pure cane sugar, no calorie, and unsweet) - so there is a little something for everyone! 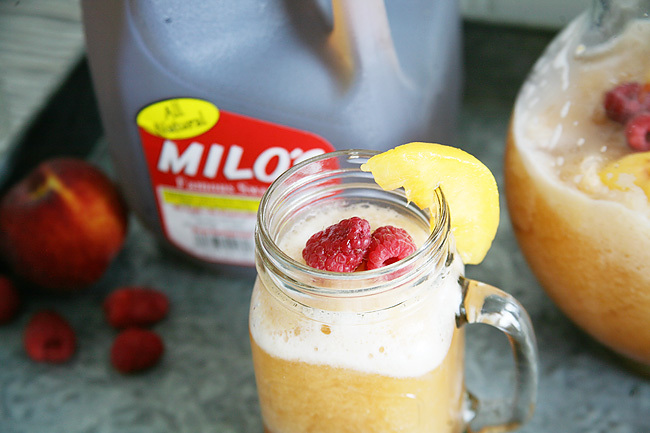 My personal favorite to drink and use in recipes is Milo's All Natural because it is sweetened with pure cane sugar. I found Milo’s at my local Target in the refrigerated juice section but they are available in lots of retailers. Find a store near you by using the store locator. Now, while I know better than to mess with making own sweet tea, I have become an expert on utilizing that delicious tea in a variety of ways. 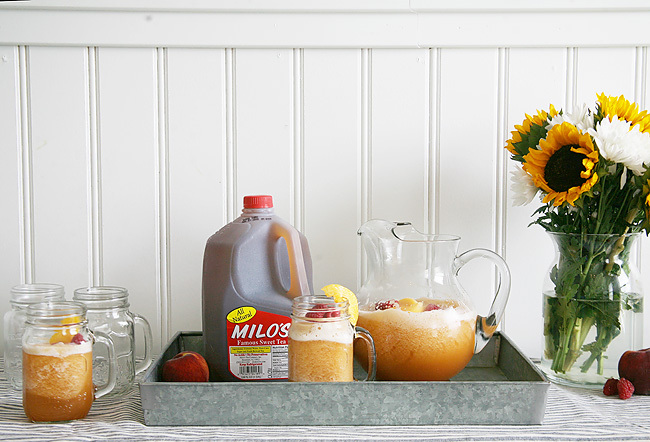 Because it's a staple in our house, I love using sweet tea as a base to make other drinks. 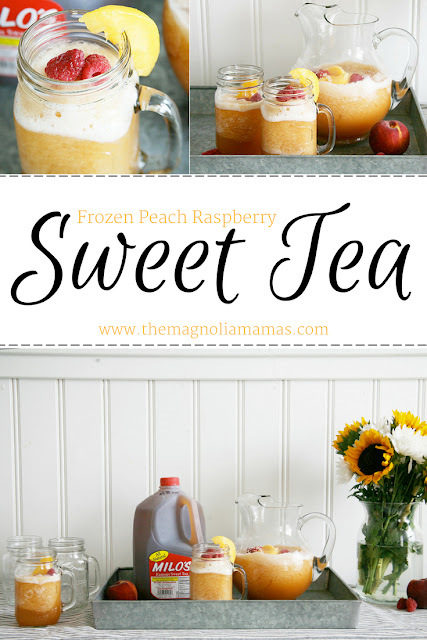 This Frozen Peach Raspberry Sweet Tea is my favorite! Georgia is the peach state after all and what kind of hometown girl would we be if we didn't marry the peach and delicious sweet tea an occasion or two? 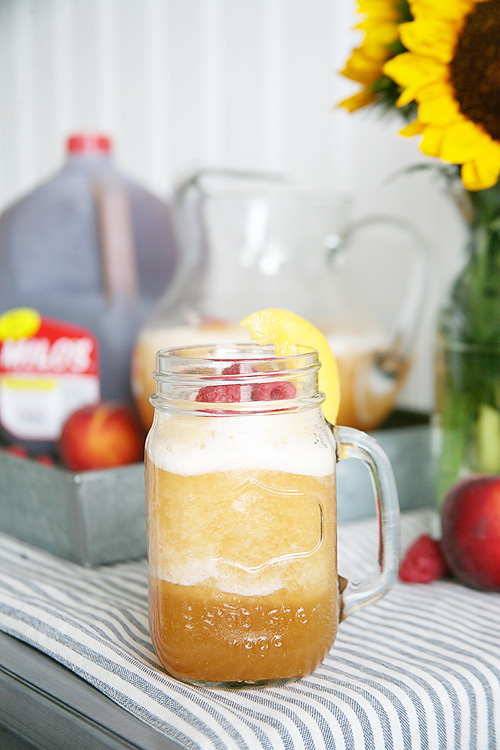 The Frozen Peach Raspberry Sweet Tea is one of my biggest crowd pleasers and it literally takes five minutes to make. 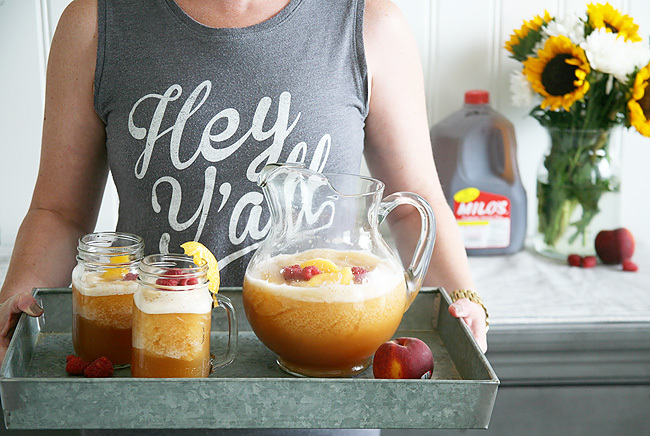 With a few shortcut tricks I've learned along the way, I've narrowed down the Frozen Peach Raspberry Sweet Tea recipe to just a few quick steps so that it making it doesn't take time away from your guests. Because trust me, you will be requested to refill that pitcher several times once everyone's had a sip or thirty. 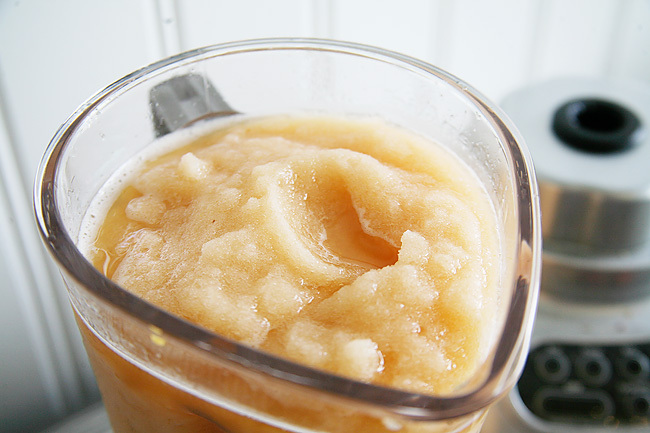 Note: I like to use frozen peaches because the recipe will end up with a frozen texture anyway, and it saves a lot of time and effort. 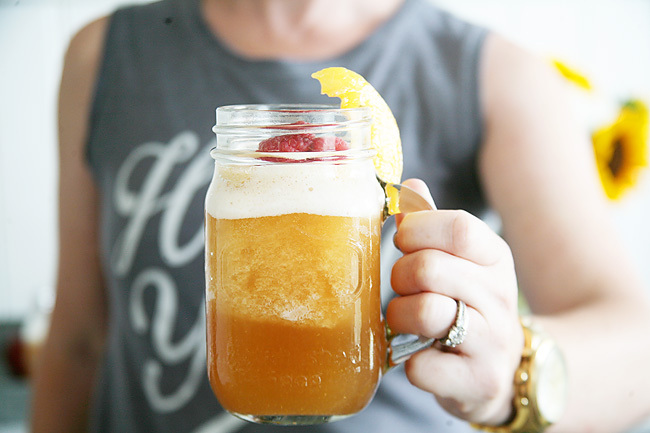 Less time slicing is more time sipping! 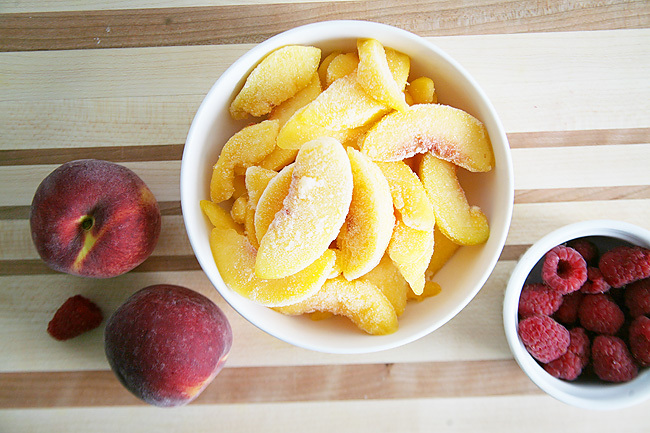 4: Garnish with fresh peach slices and raspberries. 5: Serve and enjoy immediately. Do you have a drink you make with tea? What is your favorite? Share with us! We are always looking to try a new one out with our guests.